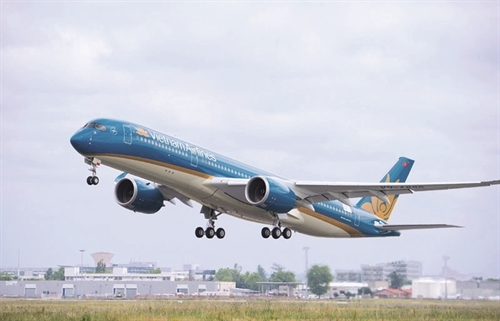 Vietnam would apply the open-sky policy so as to encourage domestic and foreign air carriers to open new direct air routes connecting the country with its major tourism markets, according to a draft decision designed by the Ministry of Transport (MOT). Accordingly, the country would conduct liberalization of the route rights; no longer restrict the 3rd and 4th traffic rights, i.e., the right to fly from one’s country to another country and the right to fly from another country to one’s country; promote the exchange of the 5th traffic right, i.e., the right to fly between two foreign countries on a flight originating or ending in one’s own country, in a way that ensures Vietnam’s benefits; encourage code sharing, multimodal transport, air charter, and opening of multi-destination routes; and permit the use of leased aircraft for international flights and plane change en route. The draft says that airlines that launch new direct air routes or raise the frequency of international flights to the country would be entitled to a raft of incentives regarding grant of the right to air carriage, takeoff and landing schedules, and air navigation service charges for arrival and departure flights. If these solutions are well implemented, by 2025, all international airports and airports permitted to receive international flights in the country would receive international non-stop flights from key tourism markets around the world. The draft also aims at further promoting liberalization of the domestic aviation market, ensuring equality among domestic air carriers of various economic sectors, and establishing a mechanism for designating domestic airlines to compulsorily exploit flight routes for socio-economic purposes. In order to improve on-time performance (OTP), specific programs and plans would be drawn up, attaching importance to human resources, aircraft repair and maintenance work, and flight schedule arrangement. Competent authorities would keep a close eye on the formulation of flight plans by carriers so as to ensure conformity with carriers’ own capacity as well as handling capacity of airports.